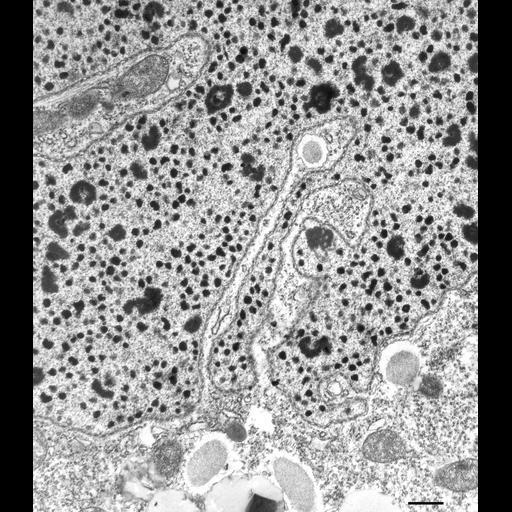 The macronucleus is the largest organelle in the P. multimicronucleatum cell and can measure 35µm long by 12µm wide. A small fraction of a macronucleus is seen in this micrograph. The chromatin appears as thousands of small electron opaque foci scattered throughout a moderately stained nucleoplasm. In addition this nucleus contains numerous larger electron-opaque nucleoli scattered equally through the nucleoplasm. Nucleoli are sites of ribosome subunit synthesis. This cell was in day 1 of the culture age study and the cell had large regions of rough ER that were covered with large numbers of ribosomes. There were many folds in the macronuclear surface. The nuclear envelope is packed with nuclear pores. TEM taken on 5/29/78 by R. Allen with Hitachi HU11A operating at 75kV. Neg. 10,000X. Bar = 0.5µm.